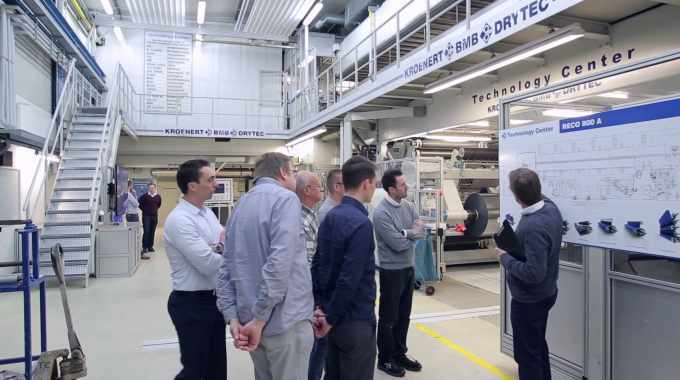 Kroenert, a manufacturer of customized coating and laminating systems, has expanded its service portfolio and conducted its first open training session for customers. The training sessions, each of which focuses on a single topic, are held at the Kroenert premises. They are designed for all customers who use Kroenert systems and are interested in expanding their knowledge to increase productivity and the competitive advantage of their production plant. In the training sessions, Kroenert experts share knowledge and present state-of-the-art technology. Participants broaden their expertise and deepen their understanding of Kroenert systems, thus enabling them to fully utilize their system capacities. Staff who have received the best possible training succeed in optimizing production processes and ensure more reliable operation with shorter downtimes, as fewer errors occur and problems can be solved more quickly. The training modules are developed by Kroenert. Engineers and technicians from the company’s various departments put together subject-related material using their specialized and practical knowledge. ‘We offer participants an ideal combination of theoretical basics and practical applications at our Kroenert Technology Center. Our experts provide participants with tips and tricks that make their daily work with our systems and the corresponding processes more efficient. This is an ideal expansion of our service portfolio,’ said Markus Plocher, head of after sales at Kroenert. ‘During the training, customers learn everything about our innovations and discover how they can improve their procedural processes. At the same time, this direct contact with our customers permits us to find out whether they are satisfied with our systems and when they encounter problems and limitations. This gives us the opportunity to continuously improve our systems and come up with innovations. A real win-win-situation which strengthens our partnership and makes it more successful,’ explained Wolfram Szczepaniak, head of technology at Kroenert.